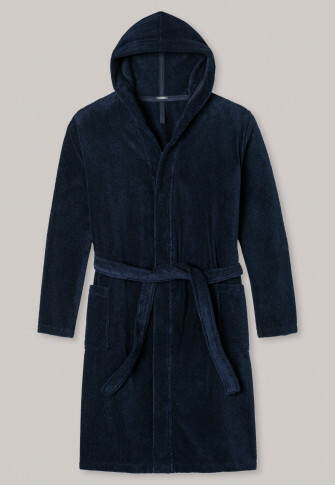 Cozy basics with guaranteed feel-good factor: this dark blue women's bathrobe promises a wonderfully cozy time, with the highest SCHIESSER quality! Large pockets and the practical hood bestow an extra portion coziness on the bathrobe, which is felt especially soft on the skin in soft terrycloth. Perfect for women who love to relax after a bath or in the morning in best, cozy SCHIESSER quality! Gute Qualität, angenehmes Tragegefühl, guter Schnitt, schöne Farbe.